I get a lot of questions about what fats and oils I use for cooking. It makes sense; after all there is a lot of confusion about fat in general. And with the increasing hype over “heart healthy” vegetable oils and their sky-rocketed consumption level, it’s no wonder people have questions about these highly over-recommended products. It’s hard to eat healthy. It’s hard to eat the right foods that help your body thrive. So let’s talk vegetable oils today: What are they? Why do I avoid them? And what are the best fats for cooking? Vegetable Oils: What are they really? Unlike traditional fats (butter, tallow, lard, olive oil, etc.) our industrial vegetable oils are a very new addition to the “food” world. In fact, they were practically non-existent until the early 1900s. But with the invention of certain chemical processes and a need for “cheap” fat substitutions, the world of fat hasn’t been the same since. 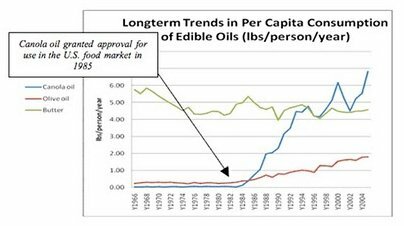 Even today, despite the fact that heart disease and cancer continue to rise at an alarming rate while butter consumption is down (and vegetable oil consumption is at an all-time high), people are still believing the hype and buying this very non-traditional, non-healthy food-like product. Vegetable Oil are Bad: an unnatural process from the start. Before we talk about the process by which vegetable oils are made, let’s first look at one of my favorite traditional fats: Butter. Step 1: Find some “canola seeds.” Oh wait, they don’t exist. Canola oil is actually made from a hybrid version of the rapeseed… most likely genetically modified and heavily treated with pesticides. Step 2: Heat the rapeseeds at unnaturally high temperatures so that they oxidize and are rancid before you ever buy them. Step 3: Process with a petroleum solvent to extract the oils. Step 4: Heat some more and add some acid to remove any nasty wax solids that formed during the first processing. Step 5: Treat the oil with more chemicals to improve the color. Step 6: Deodorize the oil to mask the horrific smell from the chemical processing. Of course, if you want to take your vegetable oils one step further, just hydrogenated it until it becomes a solid. Now you have margarine and all its trans-fatty wonder. Hopefully at this point you can see how NOT real these oils are. And in my book, “not real” is reason enough to avoid them. So how can they continue to be marketed as “heart healthy”? Along with the continued myth about saturated fats and cholesterol, these oils are promoted as healthy because they contain monounsaturated fats and Omega 3 fatty acids. And that’s what advertisers focus on to draw you into the fake health claims. But it definitely doesn’t paint the whole picture. Vegetable oils are bad because they contain very high levels of polyunsaturated fats (PUFAs). But did you know that the fat content of the human body is about 97% saturated and monounsaturated fat? Our body needs fat for rebuilding cells and hormone production. And it can only use what we give it. Polyunsaturated fats are highly unstable. They oxidize easily. These oxidized fats cause inflammation and mutation in cells. That oxidation is linked to all sorts of issues from cancer, heart disease, endrometriosis, PCOS, etc. PUFAs are bad news. Read more about PUFAS here. There’s a lot of hype about Omega-3’s and how healthy they are. But what often gets neglected is the fact that it’s more about the ratio of Omega-3 and Omega-6 fats that are critical to good health. Vegetable oils contain a very high concentration of Omega 6 fatty acids. These fatty acids oxidize easily. Omega-3 fatty acids have been shown to reduce inflammation and protect against cancer. Unbalanced levels of Omega-3 and Omega-6 fats have been linked to many types of cancers and a host of other problems. And, as you’ve probably guessed, most Americans are high in Omega-6 fatty acids and low in Omega-3’s. But people keeping buying into labels on vegetables oils that say “a good source of Omega-3s” without realizing that they are really just making the imbalance even worse. Read more about Omega-3/Omega-6 imbalances here and here. Beyond the unnatural levels of polyunsaturated fats and Omega-6 fatty acids, there are all the additives, pesticides, and chemicals involved in processing. Many vegetable oils contain BHA and BHT (Butylated Hydroxyanisole and Butylated Hydroxytoluene). These artificial antioxidants keep the food from spoiling too quickly, but they have also been shown to produce potential cancer compounds in the body. And they have been linked to things like immune system issues, infertility, behavioral problems, and liver and kidney damage. Oh yeah, and many vegetable oils come from genetically modified sources. Not sure why that’s bad? Check this out. In a nutshell, these oils are extremely unhealthy. They’ve been linked to reproductive problems, low birth rate, hormonal issues, obesity, mental decline, liver problems, and the big problems of our day: cancer and heart disease. In a world that seems overrun with these highly unnatural and toxic fats, it can seem overwhelming when looking for better solutions. And if you try to keep up on the latest “scientific” findings you may be even more confused. Luckily, you don’t have to be a nutritionist to know the best fats to use. Look to your ancestors. Look to what food was before the chemical and industrial age came in and made a mega-mart of imposters. To help you, here are some guidelines when it comes to fats and oil. When it comes to any food, keep in mind that where it comes from and how you store it can matter greatly. Traditional oils should be cold-pressed. Organic when possible (especially when dealing with animal fats as the fat is where toxins/pesticides are stored). Do the best you can, and don’t get overwhelmed by all the choices. Other fats (not necessarily for cooking, but essential to good health) include meats, eggs, dairy, and fish (nuts are also good in moderation as they have a high level of polyunsaturated fats). The following oils are okay in moderations. Most contain high levels of Omega-6 fatty acids, so they shouldn’t be consumed freely. But they are considered natural fats, and do have health benefits. They are not great for high heat cooking, but acceptable in dressings, mayos, and other non-heat foods. Simply skipping these oils in the grocery story isn’t too hard. But keep in mind that most processed foods contain these oils, too. Salad dressing, condiments, crackers, chips… check your ingredients. Don’t buy them. In fact, just skip processed foods and you’ll save yourself a lot of trouble. It’s hard to avoid rancid vegetable oils completely if you are eating out, and I personally try not to stress about the occasional night at a restaurant. By keeping these bad boys out of my house, I feel okay consuming these oils when out with family or friends. But if I find a restaurant that uses quality fats, you better believe they’ll be getting my business! If you’re like me and wish there was a simple, stress-free way approach to healthy living then you’re in the right place. My guide Processed Free will help you easily navigate real food no matter where you are on your path to healthier living. Click here to check it out..
What do you think? Do you avoid vegetable oils?